Electrical power for slew, drive, and differential track based steering. 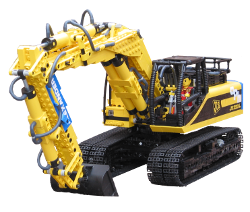 Boom, dipper and bucket are pneumatically powered with Technic cylinders, with all functions operated by a tethered remote controller that includes a four cylinder reciprocating pneumatic pump. Eventually I became unsatisfied with the Compact Excavator model, and decided to build an improved version. The larger JCB JS220 was the inspiration for this one, with opportunities to create a more detailed and powerful model. While the Hooklift Truck and All Terrain Crane had used some custom Lego components such as the prototype radio control units, I decided to make this one "pure" Lego, with no modified or custom components whatsoever, so that it could be built by anyone. Building the model this way was actually a very fulfilling challenge! I based this model on an excavator from a local plant hire company, and wanted to render the livery as accurately as possible. This meant the use of white stickers, something I had never done before as household printers cannot print white on transparent sheets. The answer was to get them printed commercially, and these high quality stickers remain in great shape today, nearly ten years later. Electrically powered drive, steer, outriggers, slew, boom telescoping, boom luffing, winch and headlights, all functions radio controlled. Functional suspension on the wheels. Having improved my building skills over the previous couple of years I decided to build the ultimate mobile crane. My initial plan was to have minimal electrical control, but soon decided against that, and went completely the other way, using two HiTechnic prototype radio control units on different frequencies. This allowed independent control of all the crane functions. Fitting all these functions into what is actually quite a small model was a serious challenge, taking many months and building iterations to complete. In my opinion the effort was rewarded, however, with this being my best model to date. Electrically powered drive, steer, tip and container load/unload, with all functions radio controlled. Model Team on the outside, Technic on the inside. In my youth I had seen hook lift trucks loading and unloading their containers, and tried unsuccessfully to figure out how they worked. 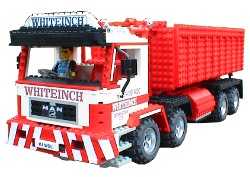 Many years later some of these trucks were working in my street, and I thought I would have another go at reverse engineering this mechanism, this time applying the results in Lego! A prototype Lego compatible radio control unit from HiTechnic helped me make a quantum leap in my Lego modelling, for the first time I was able to build a fully radio controlled vehicle rather than being limited to tethered controllers. As with the two previous models, I decided on a realistic approach to the mechanics and appearance, this time taking the realism even further, to the extent of printing my own stickers. Featuring electric drive and differential skid steering. Boom raise/lower and bucket tip are pneumatically powered, with all functions operated by a tethered remote controller that includes a reciprocating pneumatic pump. 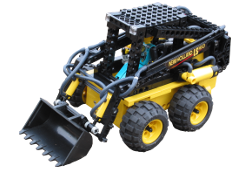 This model was inspired by the New Holland LS160 Skid Steer Loader. Fired up with enthusiasm after building the mobile crane, I acquired some more pieces including pneumatics and quickly set to work on this one. For the first time ever I used drawings of the real machine as templates for the geometry of the digging arm and bucket, modelling the vertical lift boom mechanism quite accurately. This attention to detail was what set me on the path to making models that were both mechanically and visually accurate to their real counterparts. Electrical power for slew, drive, and differential track based steering. Boom, dipper and bucket are pneumatically powered, with all functions operated by a tethered remote controller that includes a reciprocating pneumatic pump. Having found a mechanism to put two powered axles through the centre of a Technic turntable, I thought of using it power the tracks on the undercarriage of an excavator. As with the Skid Steer Loader model, I used templates based on the real machine to achieve realistic mechanical function and appearance. 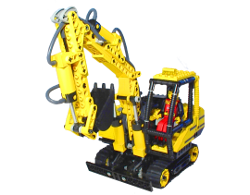 This tiny excavator turned out to be a big hit at modelshows! This was the first model I built after I re-discovered LEGO. It's a LEGO Technic style model featuring electric drive, four wheel steering, superstructure rotation, boom luffing, boom telescoping and winch. The outriggers are operated manually by a crank wheel, and control is with tethered remote device. 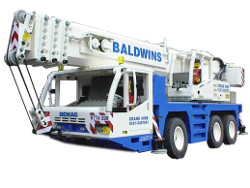 It's an electrically powered model inspired by the Liebherr LTM 1060 All Terrain Crane. 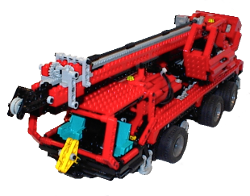 I started bulding it after I received Lego Technic Supercar set 8448 for Christmas in 1999, and subsequently found that Lego Crane set 8460 was no longer available. Of course there is also the fact that Lego Technic builders should build a mobile crane at some point in their life as a rite of passage!